Twenty seventh- and eighth-graders from PS 80 Highgate Heights Elementary, a pre-K to 8 school in Buffalo, went to college last week. Between touring campus, checking out the dining hall, and visiting the library, the middle schoolers made significant progress on a class project that involves Buffalo State student mentors. The campus visit was overseen by Highgate Heights English Language Arts (ELA) instructional coach Jason Hall, ’06, and Theresa Harris-Tigg, assistant professor of English. This semester the Highgate Heights students have been working with pre-service, secondary English and social studies education teachers from Harris-Tigg’s ENG309 Teaching and Evaluating Writing class. Both groups have been exploring the lives of refugees through literature, spending months reading, studying, and absorbing Thanhha Lai’s Inside Out and Back Again and Linda Sue Park’s novel A Long Walk to Water. 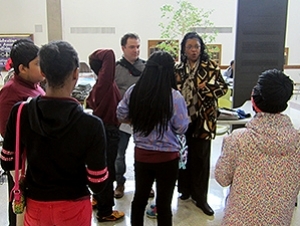 The middle-schoolers have been interacting with their Buffalo State mentors via a teaching blog, which provides a common space for feedback and discussion. While on campus, the students incorporated their research and study of Park’s book to create a two-voice poem, a piece reflecting the viewpoints of two separate characters. The assignment was to complete an original poem while at Buffalo State, then blog about the experience after returning to their home school. During the visit, some of the middle schoolers met with their mentors in person for the first time. The campus visit was just one of several experiential learning activities for Hall’s students. In order to personalize their reading about refugees, the students met with clients from Journey’s End who have resettled in Buffalo. To commemorate Veterans Day, the students toured the Buffalo and Erie County Naval Park, then wrote and read poems based on what they had experienced. For one Highgate Heights student, seventh-grader David Evans, the experience was particularly emotional as his father was killed in action while on duty in Iraq. Evans’s reading and the schools’ visit to the Naval Park was featured in the Buffalo News. “The community’s the classroom,” Hall told the News.